Bruin Day 2017 set an attendance record with admitted freshmen and their families and guests learning about undergraduate life on campus. 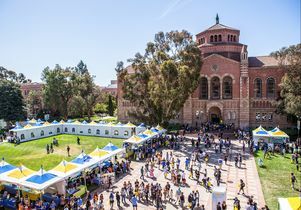 UCLA pulled out all the stops for the nearly 17,000 potential incoming freshmen and their families who visited campus for the annual Bruin Day on April 15, which for many, marked a final, exhilarating stop on their college-search journey. In his morning greeting in Pauley Pavilion, Chancellor Gene Block drew laughter as he pointed out the glorious weather that awaited a day of activities and slyly pointed out the gloomier forecast a bit farther north in the state. “This is a big decision for young people,” Block said, highlighting two specific alumni as examples of the community incoming UCLA students will join — Nobel Prize-winning biologist Randy Schekman and basketball legend, best-selling author and advocate for public service Kareem Abdul-Jabbar. In a marathon day of events, students and their families took formal or self-curated tours of campus. 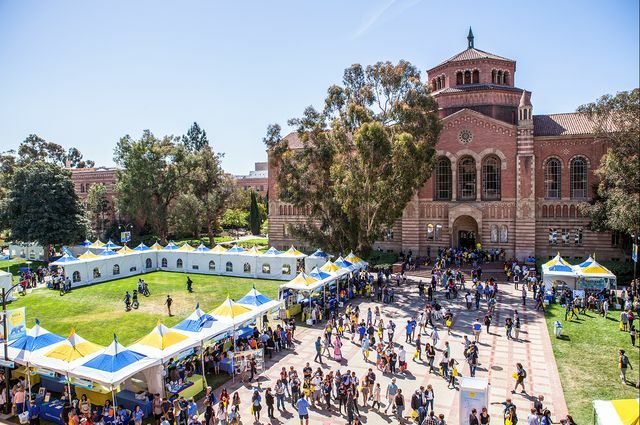 They navigated a rich sea of information on academic offerings, campus organizations and student groups, and got an eight-clap tutorial during a pep rally from the band and spirit squad at the foot of the Janss Steps. The day offered a broad taste of UCLA campus life, from the option to play oversized Jenga with Greek student groups, to attending a “Breaking Bad”-themed chemistry lecture from one of UCLA’s most popular professors Neil Garg — just one example of a robust schedule of illuminating seminars from faculty. 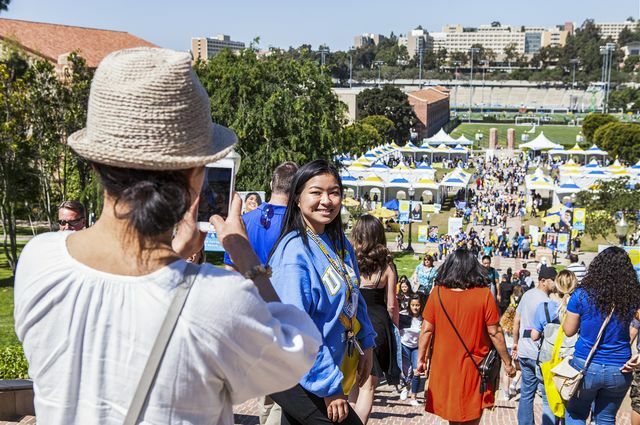 Admitted students and their families packed the top of the Janss Steps to take photos of the UCLA campus. 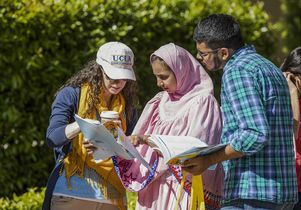 Bruin Day creates an opportunity for students to envision how they personally fit into the spirit of optimism they have been reading about in UCLA literature, he said. Incoming freshman Michelle Servin from Lawndale, California, has seen herself as a part of the UCLA community since a middle school field trip brought her to campus years ago. She officially committed to attend UCLA on Saturday, with her proud parents beside her. 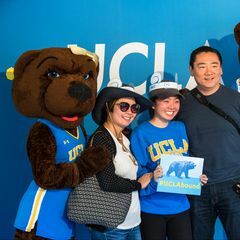 Michelle Servin and her family, from Lawndale, just after Servin committed to enrolling at UCLA for Fall 2017. Servin also participated in Raza Day, a welcome event held every year for newly admitted self-identified Chicana(o)/ Latina(o) high school students. Servin, who said that she plans to take advantage of offerings from UCLA’s academic advancement diversity program, wants to study political science and eventually become an immigration lawyer. “We’ve got a Bruin walking here,” cheerleaders shouted as Edgar Martinez entered the room where he would also officially sign up to attend. Martinez, from San Fernando, California, is the oldest child in his family and will be the first person in his family to attend college. 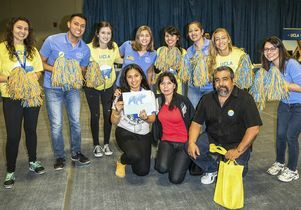 Growing up in a predominantly Latino community, Martinez said he wanted to attend UCLA in part because of the diversity in the student population and the commitment to diversity in the curriculum. “I want to be surrounded by a big mix of cultures,” he said. Martinez said that he’s still undecided on a major but hopes to find his place in psychology, political science or sociology. That’s definitely what brought Rebecca Cheung from El Monte, California to campus. Cheung wants to study environmental science and UCLA’s expertise in the field appealed to her. “I didn’t think I was going to get in, but UCLA was one of my top choices,” she said, shortly after making her commitment to UCLA official on Saturday. 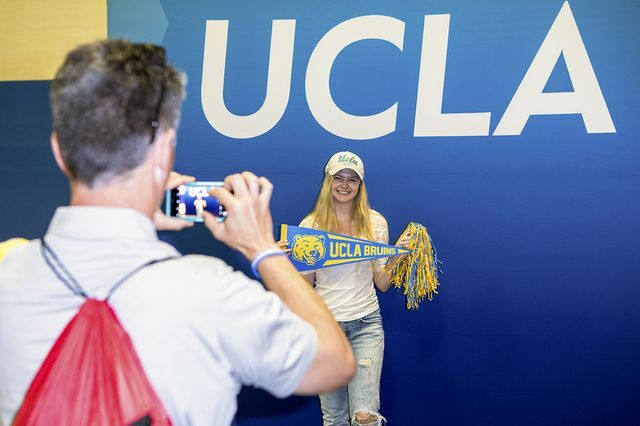 Emmalee Belleci and her dad, who is taking a photo of her at UCLA Bruin Day 2017. For dancer Emmalee Belleci from Elk Grove near Sacramento, it’s the globally focused ethos of UCLA’s world arts and cultures department that made UCLA her top choice over any other place to study dance performance. Students pondering their acceptance to UCLA made the most of the day, inserting themselves into the campus picture. Clark said families began lining up as early as 7 a.m. to take pictures with the bear statue on Bruin Walk, or with the plethora of oversized UCLA logos peppering campus. After the morning ceremony in Pauley, people flooded down to the floor where they lay down to take pictures of themselves against the UCLA logo on the iconic Nell and John Wooden Court. 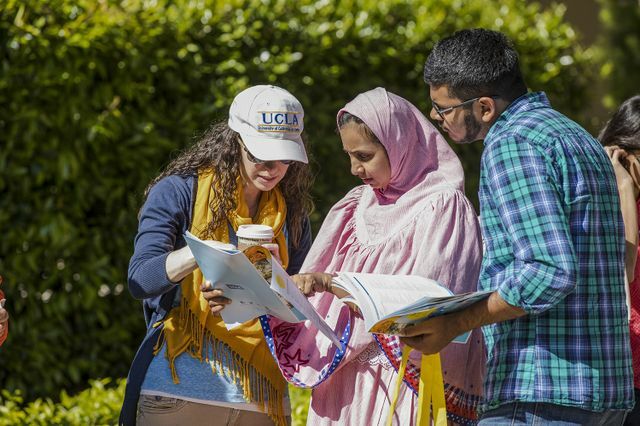 A volunteer helps a family navigate campus during Bruin day 2017. They also heard testimonials from current students. Members of the band and spirit squad shared stories of how they found a sense of community and belonging at UCLA. Undergraduate student body president Dan Siegel shared his own story during the morning welcome program, congratulating the visitors for being accepted in the most competitive admissions year in UCLA’s history. The packed scene between Royce Hall and Powell Library during Bruin Day 2017. 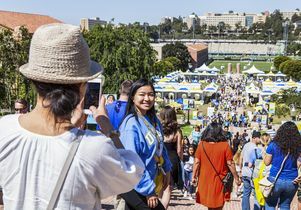 Admitted students and their families packed the top of the Janss Steps on Bruin Day to take photos of the UCLA campus. Michelle Servin and her family at Bruin Day 2017.